Description: Albert Einstein. His name has become a synonym for genius. His wild case of bedhead and playful sense of humor made him a media superstar: the first, maybe only, scientist-celebrity. He wasn't much for lab work; in fact he had a tendency to blow up experiments. What he liked to do was think, not in words but in "thought pictures." What was the result of all his thinking? Nothing less than the overturning of Newtonian physics. Once again, Kathleen Krull delivers a witty and astute look at one of the true "Giants of Science" and the turbulent times in which he lived. My Thoughts: Einstein is a scientist who has always fascinated me while baffling me with his discoveries. So I was pleased to find a biography written for middle graders that was both entertaining and informative. 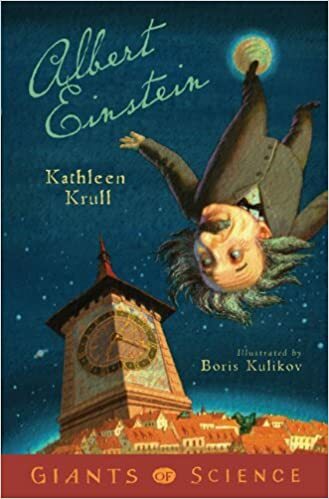 Kathleen Krull has written about Einstein in a way that makes him understandable both as a human and as a scientist. The descriptions of his discoveries were clearer than any other I have read but by no means easy to understand. I was intrigued to learn that Einstein was a visual thinker rather than a verbal one. I also enjoyed learning that he never lost his curiosity about the world and had the extreme patience to allow himself to work on a theory for more than thirty years. I liked learning how many things that are commonplace today wouldn't exist without Einstein's discoveries. I liked learning that he was much better with science than he was with people but disliked his treatment of his wives and children. I liked his devotion to pacifism and his distress that his theory of relativity lead to the development of the atomic bomb. I enjoyed this biography because it humanized one of the great names in modern science. The four papers he published in 1905 revolutionized scientists' understanding of the universe. Space and time no longer meant what people thought they meant; they behaved in ways that didn't seem to agree with common sense. Scientists are still working on the implications of what he discovered. I bought this one April 16, 2013. You can buy your copy here.